"I was playing around in the kitchen and this is what I came up with, so I decided to share it with you. These nuggets go well with a sweet chili sauce. Enjoy!" Combine panko bread crumbs, Parmesan cheese, salt, pepper, and garlic powder in a food processor; blend until finely crushed. Put panko mixture in a bowl. Whisk eggs and milk in a separate bowl to make an egg wash. Place flour in a bowl. 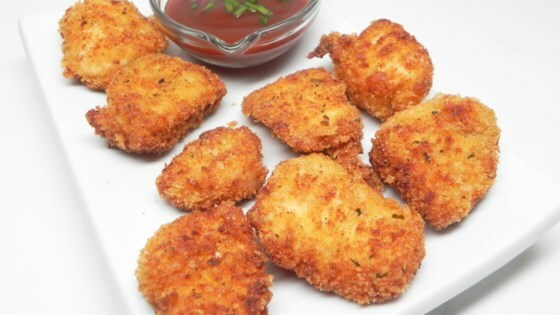 Coat chicken pieces in flour; dip them into egg wash. Press into panko mixture to coat, shaking off excess. Heat oil in a deep-fryer or large saucepan to 350 degrees F (175 degrees C). Fry chicken in batches, until no longer pink in the center and the juices run clear, about 3 to 5 minutes. An instant-read thermometer inserted into the center should read at least 165 degrees F (74 degrees C). Very good. Even my picky grandson liked them. Really easy recipe and very flavorful. Also very moist and juicy. I made it with chicken tender strips and it was wonderful! Made exactly according to recipe. Served with Trader Joe's Sweet Chili Sauce - wonderful! Tastes just like chicken nuggets. Didn't have any normal milk on hand, so I used evaporated milk instead. Didn't seem to deter from the flavor at all.